While a number of major airlines refused to fly immigrant children that had been separated from their families at the U.S. border, United Airlines (United) has announced it will be donating flights in order to reunite children who have been separated from their immigrant families. Earlier last week the Refugee and Immigrant Center for Education and Legal Services (RAICES) announced its intention to provide US$3 million to the #Flightsforfamilies initiative. With a major hub in San Francisco, United has made the move despite a potential backlash since the immigration debate is politically sensitive, but it is anticipated the carrier’s offer will be well received by the majority of Americans. United is the world’s third largest airline by revenue and a founding member of the Star Alliance. Operating a large domestic and international route network, regional flights are operated by independent carriers under the brand name United Express. The carrier operates from nine hubs, including Chicago O’Hare airport, employs over 86,000 staff and is headquartered in Chicago’s Willis Tower. Boeing and India have taken a significant step toward modernizing the Indian Air Force’s helicopter fleet by completing the first flights of Apache and Chinook helicopters destined for delivery next year. India ultimately will receive 22 AH-64E Apache attack, and 15 CH-47F(I) Chinook transport, helicopters. Effective September 1, 2018, Doug Cai is appointed President, Bombardier Aerospace, China. In this newly created position, based in Shanghai, Cai will work closely with Bombardier’s aerospace units to accelerate commercial and business aircraft sales and drive other business development opportunities across China in support of Bombardier’s growth strategy. Cai brings more than 20 years of aerospace and industrial experience to Bombardier. Most recently, he served as President, China for the Pratt & Whitney division of United Technologies. The programme is being launched in partnership with Escuela de Aviacion Mexico (EAM), located near to the Airbus Mexico Training Centre. After completing their initial training with EAM, cadets will qualify at the Airbus Mexico Training centre to become Airbus A320 pilots. Cadets will benefit from a complete and fully integrated Airline Transport Pilot Licence (ATPL) programme built upon Airbus’ high standards and worldwide experience in pilot training. The Airbus Pilot Cadet Training Programme aims to equip cadets with the skills and mindset required to become an “operationally-ready pilot”. Thanks to Airbus’ introduction of competency-based training throughout the entire curriculum, the programme focuses on the all-important development of the key pilot competencies. Global standards set by the Airbus Flight Training reference will ensure a harmonised, high quality training. Airbus also provides a bridge course from local licence to EASA licence, allowing cadets to enlarge their scope of future employers while ensuring the same high standards from a harmonised training curriculum. The programme will be open to young people over 18 years old who have graduated from high school. Candidates will undergo screening tests online and on-site. The first batch of Airbus cadets is expected to start training in January 2019, graduating in July 2020. Similar partnerships are planned across the globe over the coming years. Airbus has been offering training courses since its creation some 50 years ago and has always taken a comprehensive and innovative approach via its unique cockpit commonality concept and the regular introduction of the latest technologies or learning concepts (e.g. learning by doing). A consortium led by Leonardo has signed a €150 million contract to upgrade the baggage handling systems at Zurich Airport. The contract, which is worth approximately €120 million to Leonardo, is one of the largest in recent years in the European baggage handling field. This important achievement has drawn on Leonardo’s exclusive cross-belt technology, which is also in use with other major logistics operators. Airports in Europe and in the Gulf region, including Rome Fiumicino, Geneva, Paris Orly, Lyon, Mulhouse and Kuwait International Airport, have also chosen Leonardo’s systems. Zurich International Airport will have one of the most advanced and reliable baggage handling systems once it is fully renovated by Leonardo, being carried out in consortium with Austrian company motion06. Leonardo is responsible for the overall project management, system design and integration, as well as the supply of cross-belt sorters and IT systems, while motion06 will provide some important equipment. A key factor behind Leonardo’s success is the technological excellence of its MBHS® cross-belt sorter. The sorter was recently approved by BNP Associates, a key consultancy to the international air transportation industry. As part of a wider programme to improve and expand the infrastructure at Zurich Airport, the baggage handling project will involve most of the existing airport terminals as well as a number of buildings which are currently under construction. Design activities will start in the next few weeks, with work on-site due to commence in the second half of 2019 and with final delivery in 2025. Zurich Airport is Switzerland’s main airport and an important European hub. It has been rated by passengers as Leading in Europe (World Travel Award 2018). In 2017, the airport served over 29 million passengers, an increase of 6.3% over the previous year, and hosted more than 270,000 flight movements. Today the airport serves 185 destinations worldwide. Avolon, the international aircraft leasing company, has placed five Airbus A320neo aircraft with Cebu Air, operating as Cebu Pacific (CEB). Upon placement, Avolon will have eight aircraft on lease to Cebu Air, comprising five A320neo aircraft and three A330 aircraft. Deliveries of the A320neo will commence in H1 2019 and will be completed within the same year. JetBlue with its pilots, represented by the Air Line Pilots Association, Int’l (ALPA), have announced the ratification of a four-year contract. With 98% of eligible pilots voting, 74% cast ballots in favor of the agreement. MTU Aero Engines generated revenues of €2,148.6 million in the first six months of 2018, up 9 % on the previous year (1-6/17: €1,977.0 million). The group’s operating profit increased by 13% from €296.3 million to €334.6 million, resulting in an EBIT margin increase from 15.0% to 15.6%. Earnings after tax also increased by 13% to €237.0 million (1-6/17: €210.1 million). MTU recorded the highest revenue growth in the first six months in the commercial engine business. Revenues grew by 15% from €643.2 million to €738.9 million. The V2500 engine for the A320 and the GEnx for the Boeing 787 and 747-8 accounted for the greatest share of these revenues. In the commercial MRO business, revenues rose by 9% to €1,288.5 million (1-6/17: €1,181.0 million). 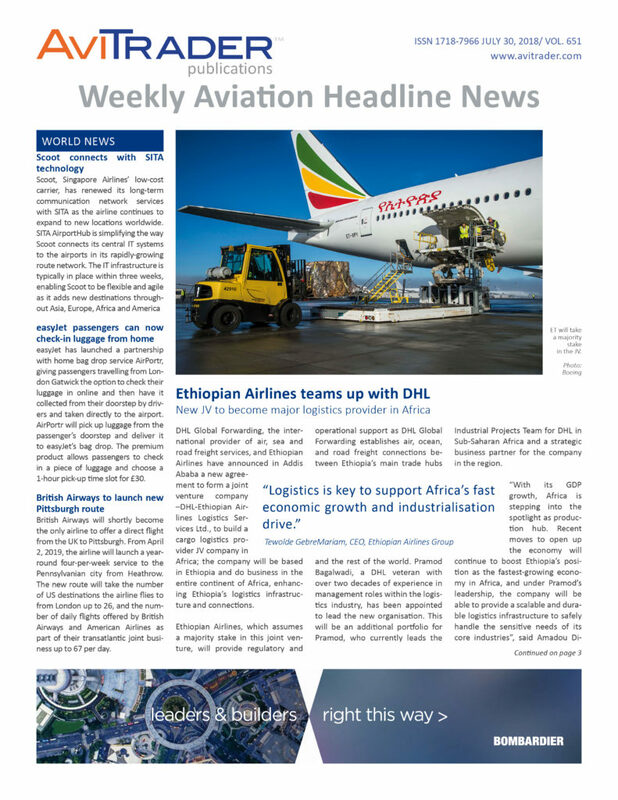 “In U.S.-dollar terms, the increase in revenues was, at 22%, far more pronounced and once again demonstrates the high demand for maintenance services. We are meeting this demand both by expanding and adding to the portfolio of our worldwide MRO locations,” Kameritsch added. The main revenue driver in the commercial maintenance segment was the V2500. At €15.5 billion, the order backlog reached a new record level at the end of June 2018 (December 31, 2017: €14.9 billion). Most of these orders relate to the V2500 and to the Geared Turbofan™ engines of the PW1000G family, foremost among them the PW1100G-JM for the A320neo. In the OEM business, MTU increased its half-year earnings by 19% from €192.3 million to €228.9 million. The EBIT margin rose from 22.8% to 24.4%. In the MRO segment earnings increased to €105.5 million, after €103.7 million in the comparative period. The EBIT margin in this segment amounted to 8.2% (1-6/17: 8.8%). 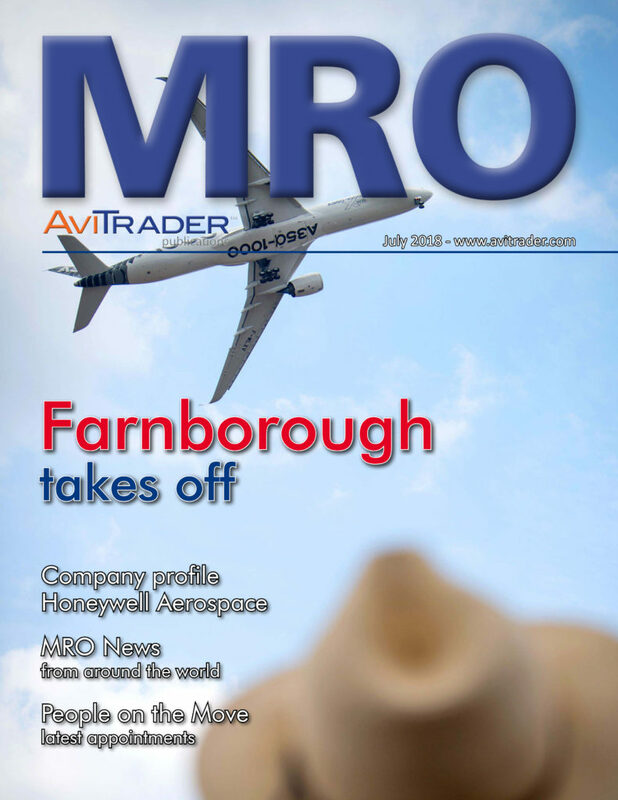 “In the first half of the year, the commercial spare parts and commercial MRO business in particular developed better than expected,” said Reiner Winkler, CEO of MTU Aero Engines AG. “We are expecting this trend to continue and are therefore able to substantiate and at the same time raise our forecast today.” MTU anticipates that its commercial spare parts business will see organic growth of around 10% in 2018. So far, the company had projected a mid-single-digit increase. In the commercial maintenance business, revenues expressed in U.S. dollars are forecast to increase by around 20%. Initially, MTU had anticipated a growth rate in the high teens. The outlook for the other segments remains unchanged, with the commercial series production business looking set to achieve the highest organic growth with around 30%. MTU expects revenues from military business to be at the 2017 level. “Overall, group revenues should reach around €4.2 billion in 2018, slightly higher than previously assumed,” said Winkler. Go2Sky of Slovakia has leased one Boeing 737-800 aircraft, MSN 32604, from a Dublin-based lessor. The aircraft was manufactured in 2002 and was previously operated by Hainan Airlines since new. It was delivered in Tallinn on July 25, 2018 after a bridging check, white paint and 189Y reconfiguration performed by Magnetic MRO. The lease was arranged by ISIS Aviation Services of Norwich, England acting as sole agent on behalf of Go2Sky. Go2Sky is an IOSA-certified ACMI specialist Boeing 737 operator with past clients including prestigious operators such as Lufthansa, Norwegian and TUI.